Green Cove Road in Huntsville, Alabama. Players ages 12 to 18 are eligible to participate. We welcome you to come out and support our players. Spring Baseball - Player Registration will be starting after Spring Break!!! 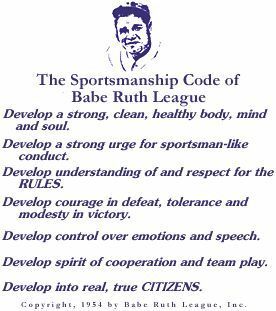 Consolidated Walk-in registration for the Spring 2019 Babe Ruth Baseball League Season (for boys ages 12-18) will be held on Saturdays March 30, April 6, and April 13 from 12 noon to 3 pm at Sandhurst Park. This registration is for the consolidated Huntsville Baseball League Program (which invites players located in both HSV and surrounding communities) that will play on teams playing based in at either Sandhurst (South) or Optimist (East) Parks. Individual (recreational) players or travel ball (competitive) teams may register. The cost is $100 per player for individuals registering for recreational play. That is still less than $8 per game for each player! Travel ball or competitive organized teams may register for $1300 per team. No registrations will be accepted after the coaches meeting. ***DISCOUNT available for early recreational player registration ... Any individual player (recreational league) that registers by 3 pm Saturday, April 6 will pay a discounted fee of $85 (save $15). Please note the firm cutoff date & time for the discount - no exceptions. The registration forms are under the Handouts page (click on "Handouts" in the Main Menu to the left of the screen). Parents & coaches may also register by filling out one of the registration forms and mail the registration form, concussion form, and birth certificate to league officials. Or print and fill out the registration form and concussion form, scan both, and e-mail it to league officials (and arrange to hand in the birth cert. & fee). *** We will also need coaches. The league does not exist without parent volunteers! If you have questions, please ask. ***Game play will start ~May 4th and end in early July. or certified coach may identify concussive signs, symptoms, or behaviors of an athlete during any type of activity. a parent must also complete and submit a signed form to any HBRL official. It is available in the Handouts section. The 2002 Alabama Sports Law is designed to protect "sports officials" from the crimes of menacing, harassments, and assault. supervise the events, such as coaches or league officials. It is a class "C" felony for a conviction on this law. The entire law and the code of criminal punishment for conviction is available in the Handouts Section.